Based on director Tony Richardson's theatrical production at the Roundhouse Theatre in London, this film is a powerful adaptation of William Shakespeare's epic tragedy. 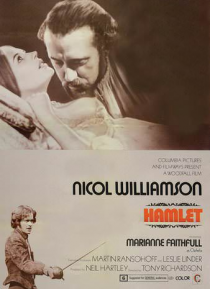 Eschewing the big-budget production values of other film versions, it instead focuses on great performances from Nicol Williamson as Prince Hamlet, Anthony Hopkins as the villainous Claudius and rock-and-roll singer Marianne Faithf… ull as Ophelia. The result is a HAMLET that is a compelling tribute to the Bard himself. Newly remastered.